These Fine Edition Classics from White's Books have been my wish list for quite sometime, I believe since I saw this article. After searching high and low the last few weeks online in many British books shops and even ebay.uk I found them, but didn't really want to deal with high international shipping rates, long waiting time, and import fees, so I was hesitant. But then, I found these babies on good 'ole Amazon and they were instantly ordered up. Good news, Santa is bringing these gorgeous books to our family for Christmas! A few years ago I adopted the : want, need, wear, and read policy for Christmas and they happily fall under the 'read' category for our whole family. Aren't they stunning, I can't wait to see them in person! They are also working on a re-design for Great Expectations, and since that is one of my husband's most favorite books, I especially look forward to seeing it. Find them all here , but just as a head's up some of the quantities seem to be limited. love love love old books! 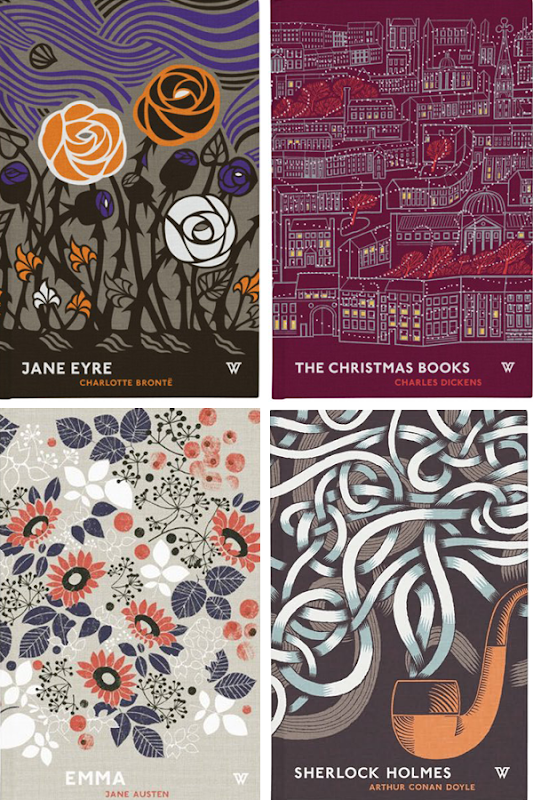 the idea of White's books is so great - vintage inspired covers on modernly printed texts. These are gorgeous. PS love the want, need, wear, read policy. I love that Sherlock Holmes one! Yes--these are so beautiful. I will be ordering these for my darling 16 year old daughter. These are amazing! And the Jane Eyre book is out just in time for the new film. LOVE these. REALLY love these. adding to wishlist complete. Love the Jane Eyre design, I like these better than the Penguin classics. I wonder if these are hard bound. ALSO- just saw someone commented on a new movie-- whatttt? must go check that out now. The cover art on these is stunning! Thank you for sharing the inspiration. Thanks for sharing, I love beautiful book covers. That Jane Eyre one is my favorite. They are beautiful - though I sort of wish the title choice was a bit quirkier. Some of these are already out, and I got one, in the that special edition by Penguin! Will nobody do a special edition of I Capture the Castle, or The Hobbit, or The Talented Mr Ripley. Or some Wodehouse. Or for things on public domain, dunno, War and Peace, or The Count of Monte Cristo, or the Dangerous Liasions or Vanity Fair or D.Quixote something by Trollope. Because dear Emma and Jane Eyre, we are friends but I can not keep buying you! Glad you found them on amazon. Just a tip for any future occasions, if you want british published books, try http://www.bookdepository.com, the shipping is free for a lot of countries. in case it is useful to anybody! I love the Sherlock Holmes!